than 250 people have died and nearly 3 million people are affected. The Consulate in Chiang Mai was closed for several days last week also due to flooding. Canals have been drained to allow for excessive water flow and sandbags have been piled up around the city. North and central provinces have until now borne the brunt of the floods. 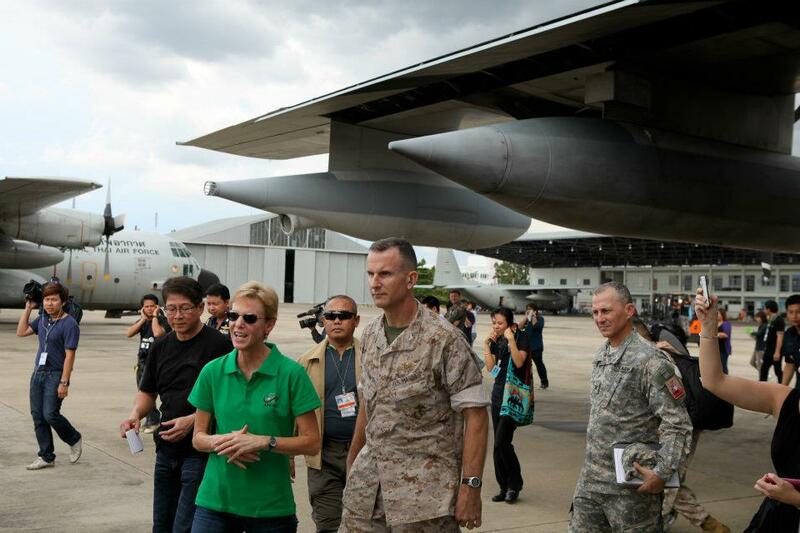 The United States has so far contributed 3 million baht to the Thai Red Cross for relief supplies. and NGOs on disaster assistance. Ambassador Kenney greets U.S. Marines at Don Muang Airport. 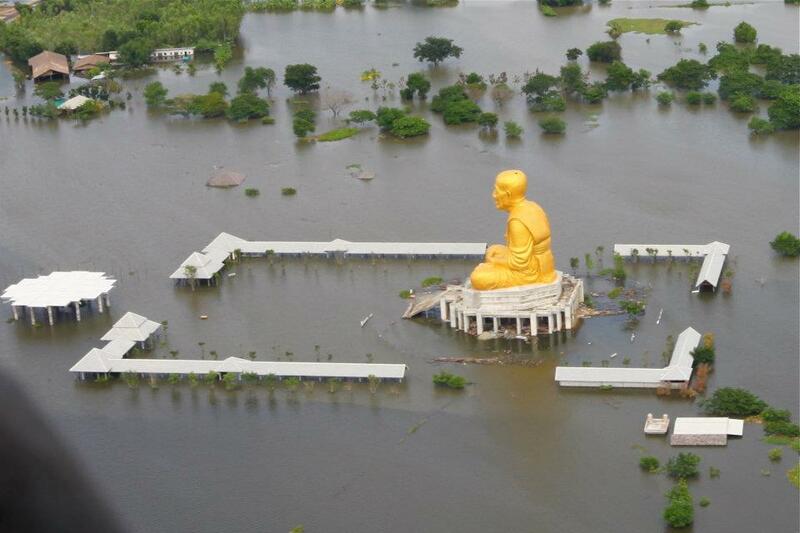 Aerial photo of flooded areas north of Bangkok. The Bangkok Metropolitan area has experienced localized flooding in northern and eastern areas and most reports indicate that the flooding risk for the Bangkok area will peak between October 16 -18. As a purely precautionary measure, U.S. citizens assigned to the Embassy who live approximately 12 kilometers north of central Bangkok in Nichida Thani have the option of relocating for a few days to central Bangkok until the anticipated peak flood period subsides, should they wish to do so. Extensive flooding in Thailand, especially in Central Thailand between Bangkok and Sukhotai, has caused considerable damage and loss of life. In many flooded areas, surface transportation has either been suspended or diverted around those areas. Portions of highways are closed and bus and train services linking Bangkok with points to the north are suspended. More photos of the flooding can be viewed here; photos are in FB so I cannot embed them here. Reimbursement of travel costs when going home on leave. Reimbursement of travel costs when obtaining necessary medical care when such care is not available locally. Reimbursement of travel costs when evacuating family members who are in imminent danger. Reimbursement of travel costs when transporting furniture and other personal effects when moving to another duty station. Mandatory leave for employees who have returned home after a three-year deployment. Agencies also will no longer have the option to offer leave to employees who had served in a war zone for 18 months. Medical examinations, mental health care, inoculations, vaccinations and other preventative care. A death gratuity equal to one year’s salary when an employee dies of injuries sustained while supporting military operations. I have not read the OPM notice but I am presuming that these changes applies to non-Foreign Service and non-Defense employees serving in those three priority countries. The 2010 OIG review of US Embassy Pakistan indicates that there are some three dozens non-State and non-DOD personnel in that country (DEA: 16, FBI: 7, DHS: 4, BBG:1, DOE: 1, NAS: 8, Treasury: 1). On the U.S. Embassy Iraq staffing — well, trying to pin down the staffing number over there, is of course, rocket science and I simply do not have the brains for it. Also, with the military withdrawal and the embassy taking charge, a whole lot of big numbers are bring thrown around – 5,000 – 17,000. Security people is a big component but not sure how many non-State/USAID and non-DOD personnel will continue to deploy in Iraq and our consulates there when all is said and done in 2011. Due to the recent “flavor of the month” in Afghanistan, the civilian uplift staffing picture there is a bit more clearer. Seven civilian agencies (State/USAID excepted) account for about 26% of the total civilian uplift. So all those folks, plus some three dozens in Pakistan and an undetermined number in Iraq will be affected by Congress’ non-renewal of warzone benefits. In short, if they need mental health care after service in the warzones, they’re basically out of luck? This will have an impact to the employees already deployed there, but may have a larger impact on recruitment of employees for the 2012 assignment and onward. […] State increased its civilian personnel deployed to Afghanistan from 192 in January 2009, to 501 in March 2011—an increase of 309 personnel. State has an additional 81 authorized full-time equivalent positions for the civilian uplift as of May 31, 2011, but the positions are currently unfilled. According to State officials from the Bureau of South and Central Asian Affairs (SCA), they will continue to place additional civilian personnel in these positions through fiscal years 2011 and 2012. USAID had the second largest presence of any agency prior to the start of the uplift. USAID personnel increased from 85 in January 2009 to 307 as of March 2011, an increase of 222 personnel. USAID has an additional 80 authorized positions for Afghanistan that are currently unfilled. According to USAID officials, they will continue to place additional U.S. civilians in these positions in fiscal years 2011 and 2012. As of June 2011, the other seven civilian agencies with a presence in Afghanistan accounted for an increase of 189 personnel, or approximately 26 percent of the total civilian uplift. These agencies provide personnel at the request and direction of the Chief of Mission in Afghanistan and State officials in Washington in order to meet the mission’s strategic goals. The Chief of Mission determines the number of authorized civilian uplift positions in consultation with each department. DOJ accounted for an increase of 78 personnel, or 11 percent, of the total civilian uplift. The majority of these uplift personnel are employees of the Drug Enforcement Administration who work on mentoring and training Afghan law enforcement entities in an effort to promote the rule of law. In addition, they provide leadership and guidance in the conduct of bilateral counternarcotics investigations and operations. USDA has deployed 59 civilian uplift personnel as of June 2011, representing eight percent of the total civilian uplift. These employees primarily mentor Afghan government officials at the Ministry of Agriculture, Irrigation, and Livestock. The remaining five agencies account for approximately seven percent of the total civilian uplift. DHS personnel advise, mentor, and train Afghan border, customs, and related entities to enforce Afghan customs and immigration law. Treasury places technical experts at Afghan government ministries where they provide assistance in four areas: strengthening budget and financial accountability, combating economic crimes and corruption, building internal audit capacity and increasing non-tax revenues, and achieving debt relief and improving debt management. Transportation personnel advise officials at the Afghan Ministry of Transport and Civil Aviation on issues such as civil aviation law and surface transportation planning. HHS personnel work on health programs, such as programs to strengthen maternal and child health services in Afghanistan. Finally, Commerce personnel assist with efforts to promote Afghanistan’s economic development and trade. For over 50 years the families of Foreign Service Officers have been bringing bargains and fun to the public and the State Department. There are thousands of used books of all kinds – foreign language, history, diplomacy, children’s, politics, etc. The Collector’s Corner has rare and valuable books, with a special collection this year of books belonging to Henry Kissinger, some inscribed, donated by the Nixon Library. The Art Corner has carvings, ceramics, paintings, fabrics, collectibles from all over the world and the Stamp Corner offers international stamps, coins, paper money and post cards. Two weekends, October 15-16 and October 22-23 from 10 am to 4 pm in the Diplomatic Exhibit Hall of the US Department of State, entrance on C Street between 21st and 23rd Street, NW, Washington, DC (the side of the building that faces the Lincoln Memorial). Bring a photo ID. It is within walking distance of the Foggy Bottom Metro. Sun Oct. 16, 10 am to 4 pm, public welcome. Saturday-Sunday Oct. 22-23, 10 am-4pm, public welcome. On the last day, October 23, books are HALF PRICE. Visa, Discover, Mastercard, checks and cash accepted. Proceeds benefit community projects and scholarships. For more information, call 202-223-5796 or visit www.aafsw.org. The wonderful folks of AAFSW not only sponsors projects and scholarships, they are most often there when you go back to the D.C. area and there’s no one else to call. An acquaintance once was pregnant and alone in the D.C. area (husband decided to return to post prior to baby’s arrival) and one of her friends asked help on her behalf from AAFSW. The pregnant lady was not even a member. The ladies of AAFSW not only visited her, but also offered to drive her around, and volunteered to be on call should she need help when labor starts. Fantastic and amazing! These folks rock! If you’re in the area, please stop by and support AAFSW. What Is the Keystone XL Pipeline — and Why Is It So Controversial? by Lois Beckett ProPublica, Oct. 14, 2011, 12:41 p.m.
By the end of this year, the State Department will decide whether to give a Canadian company permission to construct a 1,700-mile, $7 billion pipeline that would transport crude oil from Canada to refineries in Texas. The project has sparked major environmental concerns, particularly in Nebraska, where the pipeline would pass over an aquifer that provides drinking water and irrigation to much of the Midwest. It has also drawn scrutiny because of the company’s political connections and conflicts of interest. A key lobbyist for TransCanada, which would build the pipeline, also worked for Secretary of State Hillary Clinton  on her presidential campaign. And the company that conducted the project’s environmental impact report had financial ties to TransCanada. The debate over the pipeline is both complicated and fierce , and it crosses party lines, with much sparring over the potential environmental and economic impacts of the project. More than 1,000 arrests were made during protests of the pipeline  last summer in Washington, D.C.
Here’s our breakdown of the controversy, including the benefits and risks of the project, and the concerns about the State Department’s role. Proponents of the project point to two main benefits for Americans. First, it would improve America’s energy security , because it would bring in more oil from friendly Canada and reduce our dependence on volatile countries in South America and the Middle East. Secondly, the pipeline would create well-paying construction jobs and provide a broader economic boost to the American economy. Labor unions have supported the project . TransCanada estimates that the project would directly create 20,000 construction and manufacturing jobs for Americans . A study paid for by TransCanada  also estimated the economic impact over the life of the pipeline at about $20 billion in total spending. Critics of the project have also questioned whether the pipeline’s oil, once processed in American refineries on the Gulf Coast, would actually be sold to Americans rather than being exported for sale elsewhere . As a New York Times editorial opposing the pipeline noted, five of the six companies  that have already contracted for much of the pipeline’s oil are foreign companies — and the sixth focuses on exporting oil. The Washington Post, which editorialized in favor of the pipeline , said this should not be a major objection. “The bottom line remains: The more American refineries source their low-grade crude via pipeline from Canada and not from tankers out of the Middle East or Venezuela, the better, even if not every refined barrel stays in the country,” the Post editorial stated. Because the project crosses the U.S. border, it requires a permit from the State Department. As part of that process, the State Department did an environmental impact report . The study concluded that, if operated correctly, the pipeline would have “limited adverse environmental impacts.” But a New York Times investigation found that the company that the government hired to conduct the study had significant financial ties to TransCanada  — and that this conflict of interest “flouted the intent of a federal law” requiring federal agencies to select contractors that have no potential interest in the outcome of the project being evaluated. Environmental groups have also scrutinized the relationship between State Department officials and TransCanada’s representative in Washington. Paul Elliott, who worked on Hillary Clinton’s presidential campaign, was actively lobbying the State Department and Congress  about the project for a year and a half before he officially registered as a lobbyist, according to State Department email messages made public by the environmental group Friends of the Earth . Elliott did not comment on the emails, but a TransCanada spokesperson said he was simply doing his job as a lobbyist. The emails showed a friendly relationship between Elliott and his State Department contact, who wrote “Go Paul!”  when Elliott secured the support of a key congressman for the Keystone project. The State Department has said that it will consider the merits of the pipeline proposal impartially . TransCanada had originally sought permission to use a higher-than-usual pressure in its pipeline  but publicly backed away from the request in response to the concerns of citizens and politicians that higher pressure might increase the risk of leaks and environmental damage. The proposed route of the pipeline passes over the Sandhills wetland of Nebraska — and over the most important aquifer in the nation, the Ogallala Aquifer, which provides drinking water and irrigation to a large swathe of Midwestern states . This has prompted opposition from Nebraska politicians. The state’s Republican governor wrote a letter  to President Obama asking him not to approve the project, and state legislators are considering legislation  limiting where the pipeline can be located. “Clearly, the contamination of groundwater is the top concern,” State Sen. Mike Flood told reporters . Opposition to the pipeline is so broad in Nebraska  that a TransCanada-sponsored video that was perceived as supporting the pipeline was booed at a University of Nebraska football game , which resulted in the Cornhuskers athletic department ending a TransCanada sponsorship deal . But at least one scientist with significant experience with the Ogallala Aquifer said fears about contamination from the pipeline are overblown . James Goeke, a hydrogeologist and professor emeritus  at the University of Nebraska, wrote on The New York Times’ website that the geography of the aquifer — there’d be clay between the pipeline and the water, and much of the aquifer is uphill from the pipeline’s proposed location — means that a leak in the pipeline “would pose a minimal risk to the aquifer as a whole.” He suggested the government “require TransCanada to post a bond for any cleanup in the event of a spill,” and noted that in particularly vulnerable areas, TransCanada has promised to encase the pipeline in cement. The Keystone XL pipeline would carry a diluted form of tar sands, a type of natural petroleum deposit. Environmentalists argue that the tar sands, or “dilbit,” mixture that the pipeline would transport  is more corrosive than typical crude oil, and thus might cause more leaks in the pipeline. These fears were heightened by an oil spill in Michigan  that leaked roughly 800,000 gallons of tar sands into Michigan’s Kalamazoo River in July 2010. The spill came within 80 miles of Lake Michigan, and a year later, the Environmental Protection Agency has ordered Enbridge, the energy company responsible for the spill, to conduct further cleanup, citing pockets of submerged oil covering about 200 acres  of the river’s path. Some property owners whose land the pipeline would cross have spoken out against the company’s approach , particularly the fact that a Canadian company is able to use eminent domain to acquire the use of private land. The issue has struck a nerve across the political spectrum and has helped bring together Tea Party and environmental activists in Texas  to oppose the project. Available evidence suggests that oil sands, on a “well-to-wheels” basis, have 15 to 20 percent higher greenhouse emissions than conventional oil. This is because of increased energy demand during extraction and the use of high-carbon fuels like petroleum coke. Also, water pollution concerns plague mining-based projects that produce large volumes of tailings (a contaminated, watery waste product). Critics of the project  argue that approving Keystone XL could have a “chilling effect” on efforts to create green jobs, and that it would demonstrate that the U.S. is not serious about its climate change leadership — and that Canada is not serious about trying to reach its Kyoto targets.